Pairs to your laptop or tablet with Bluetooth Smart technology (range is up to 32'). Pairs to your laptop or tablet with Bluetooth Smart technology (range is up to 32'). No wires needed. Control the mouse with either hand. Runs on 2 AAA batteries, which are included. Up to 6 months of battery life. Battery life will vary depending on the product configuration, product model, applications loaded on the product, power management setting of the product, and the product features used by the customer. As with all batteries, the maximum capacity of this battery will decrease with time and usage. Battery status indicator lets you know when the battery is running low. The contoured and modern Designer Bluetooth Mouse pairs wirelessly to your laptop or tablet with the latest Bluetooth Smart technology to instantly connect without wires or dongles. Not only do you get wireless convenience without any dongles or transceivers to lose (or cables to pack up or trip over), you get an elegant product designed to enhance your Windows experience. 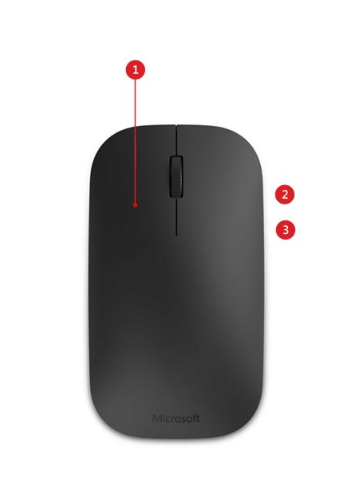 Ambidextrous design means you can use your mouse with your left or right hand, it’s comfortable either way. * BlueTrack Technology does not work on clear glass or mirrored surfaces.